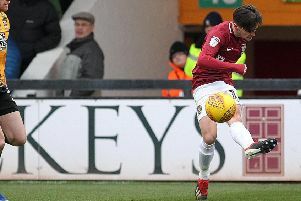 The Cobblers have made their second signing of the January transfer window, bringing in West Ham United youngster Joe Powell on loan until the end of the season. Powell, who turned 20 in October, is an attacking midfielder who has been a regular in the Hammers’ Under-23 team in Premier League 2 this season. He has also made one full first team appearance, coming on as a second-half substitute in West Ham’s 8-0 hammering of the Cobblers’ Sky Bet League Two rivals Macclesfield in September. He was subsequently named on the substitute’s bench for West Ham’s Premier League game against Leicester City in October as well as their Carabao Cup fourth round tie with Tottenham Hotspur, but didn’t get on. Powell has scored in three of the past four West Ham Under-23s matches, netting in his most recent appearance as the Hammers drew 1-1 with Tottenham Hotspur U23s on January 13. In all this season, he has made 14 starts and one substitute appearance for the U23s, scoring seven goals. The Londoner has been at West Ham since the age of six, and has already played at the PTS Academy Stadium. Powell was part of the Hammers U21s team that drew 1-1 with the Cobblers in an EFL Trophy match back in November, 2016. Also in the West Ham team that night was Declan Rice, who is now first team regular at the London Stadium. This will be Powell’s first loan spell away from West Ham. He signed a three-year contract with the east London club in the summer of 2016, and that deal will run out this summer.